(Jan. 15, 2018) – Jade “The Headhunter” Jones is the heart of Team Great Britain and with two Olympic gold medals around her neck, she can claim to be the most famous, most be-medalled active fighter in the sport today. This makes her the dominant player in the women’s -57kg category, but her record in the 2017 fighting season has been rocky. So the sharks are circling. The two most serious contenders for Jones’ crown are Korea’s Ah-reum Lee and Turkey’s Hatice Ilgun. 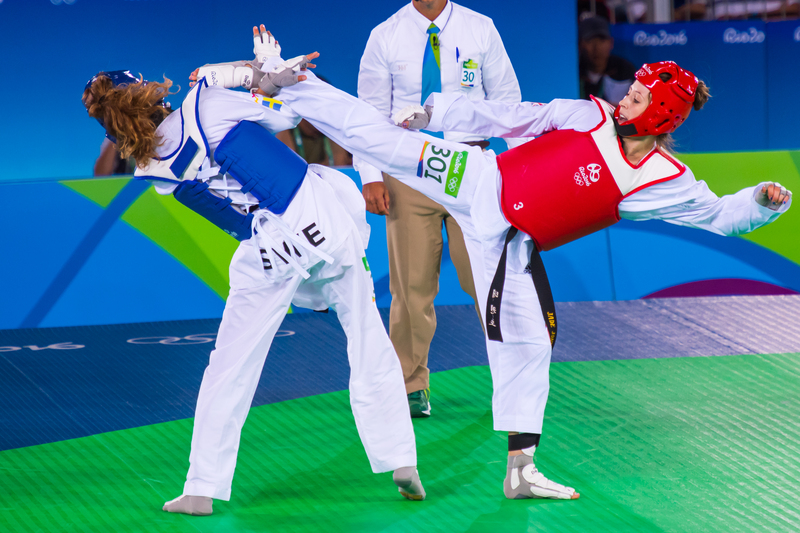 The two represent the up-and-coming generation, for Jones’ long-time rival, Eva Calvo Gomez of Spain, has not been seen at top-flight competition since being comprehensively defeated by Jones in the finals in Rio, while the visibility of Japan’s powerful Mayu Hamada and Egypt’s elastic Hedaya Malak has also fallen. This means the most likely medalists in Wuxi are Jones, Lee and Ilgun. How do these women warriors stack up against each other? Jones has never won a world championships title, even though she has been fighting for it since 2011 and was expected to win in 2017. In Jone’s fascinating semi-final clash with Lee in Muju, Lee successfully used her front, right leg kick to frustrate Jones, and deployed an effective ax kick to the head of “The Headhunter.” Moving on to the Moscow Grand Prix, Jones was again beaten by Lee, who scored a plethora of points wielding a wicked punch and left-leg kick. The British athlete’s first big gold medal win in 2017 was her victory on home turf at the London Grand Prix. Jones – who appeared to have adjusted her game plan against the Korean – took out Lee with body attacks and punches. 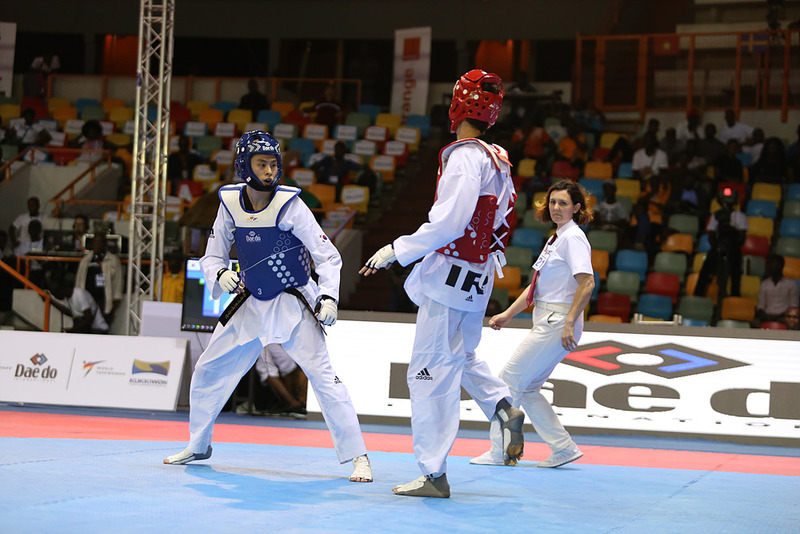 Jones prevailed again in the Grand Prix final in Abidjan, beating the sister of her long-time rival, Marta Calvo-Gomez, in the final. Two Grand Prix golds in one year is a superb achievement, but even so: Jones’ previous winning form appears to have degraded somewhat over 2017, following her breakup with longtime super-coach Paul Green, who has since moved to Team USA. 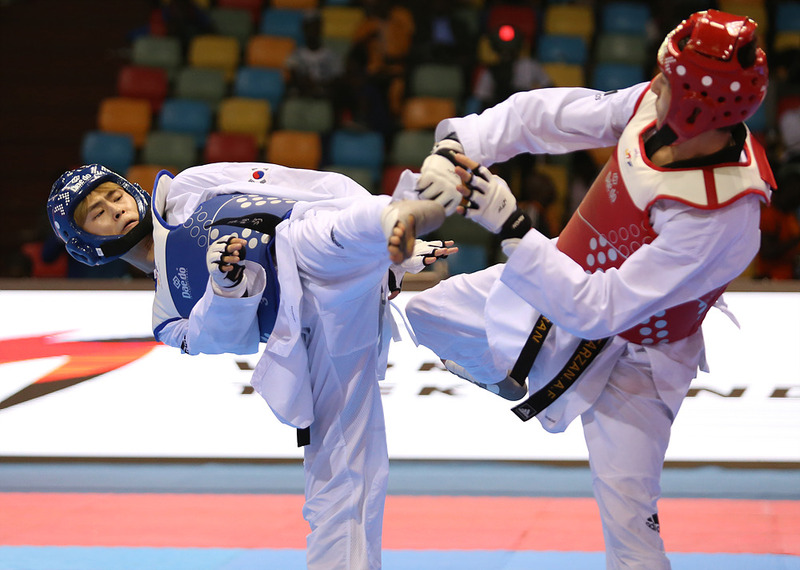 Lee had a fine season early in the year, winning the Muju Worlds and the Series 1 Grand Prix in Moscow. But she lost to Ilgun in the Summer Universiade in Taipei and then lost to the Turk again in the Series 2 Grand Prix in Rabat. Ilgun has been a rising star this year. After taking out Lee in Rabat in the semis, she went on to beat Jones in the final. So this is a tricky category to predict: After the exhausting 2017 season, injury management and physical stamina will count for a great deal – and when it comes to physique, the ultra-toned Jones looks to have the advantage. Of course, on the day, any of the other players in the category could walk away with gold. On recent form, Jones and Ilgun look stronger, but overall, Lee had a better year. So: Expect one (or all) of these three musketeers to be on the podium in Wuxi – though who will be standing where is not something anyone would want to bet on. In sport, anything is possible. Champions fall at the first hurdle; new stars rise. Even so, in any sport there are superstars who dominate with consistent strings of victories at the highest level. 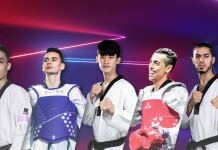 Currently, taekwondo’s superstars are Team Korea’s Dae-hoon Lee and Great Britain’s Bianca Walkden – who are both, not coincidentally, the 2017 Male and Female Players of 2017. But there is a third player in today’s game who is almost as dominant, but not quite as visible as these two: Korea’s Tae-hun Kim. (Despite the similarity in names, he is no relation to Lee.) Like Lee and Walkden, Kim has not lost a single major championship this year. This means that in Wuxi in the men’s -58kg category, the tall, slim Korean is the man to beat. Kim is that rare beast: a triple world champion. Tall, skinny and long-legged he has the perfect physique for taekwondo and is perhaps the greatest roundhouse kicker in the sport at present – a weapon he wields equally confidently with both legs. His roundhouse takes an unusual flight path, coming up and around his opponent’s guard – a true ninja kick. He is also a master at fight management, adjusting his tempo and leading the match’s pace. The only real rival he faced in the category was the even taller Shuai Zhao of China, the Rio Olympic gold medalist, but the Chinese lad has moved up a weight category leaving the Korean with few rivals. Even so, the fighters in this category will have studied Kim down to the most miniscule detail, and will be gunning for him in the near-certainty that he will reach the finals. On present form, two big threats are Team Russia’s Mikhail Artamonov, winner of the 2017 Series 3 Grand Prix in London. (Kim did not appear in London, due to Team Korea selection processes back home.) Then there is the highly experienced and consistent Spaniard, Jesus Tortosa. But neither seems to possess the tactical nous, or the physical weapons, to take out the Korean super kicker. Two other threats are Iran’s Farzan “The Tsunami” Ashourzadeh and Mexico’s Carlos “Charley” Navarro. “The Tsunami” was one of the most dangerous fighters not just in this category, but in the world in 2016, – but, like other members of the once-mighty Iranian Men’s Team, was unlucky in Rio, and does not seem to have fully recovered his form since. Navarro is one of the most entertaining fighters in the sport: In a game where front-leg tactical kickers dominate, he is a superb jump spinning back kicker. But at this level of competition, wily tactics tend to beat spectacular technique. And Kim will face two hungry young team mates in Wuxi. 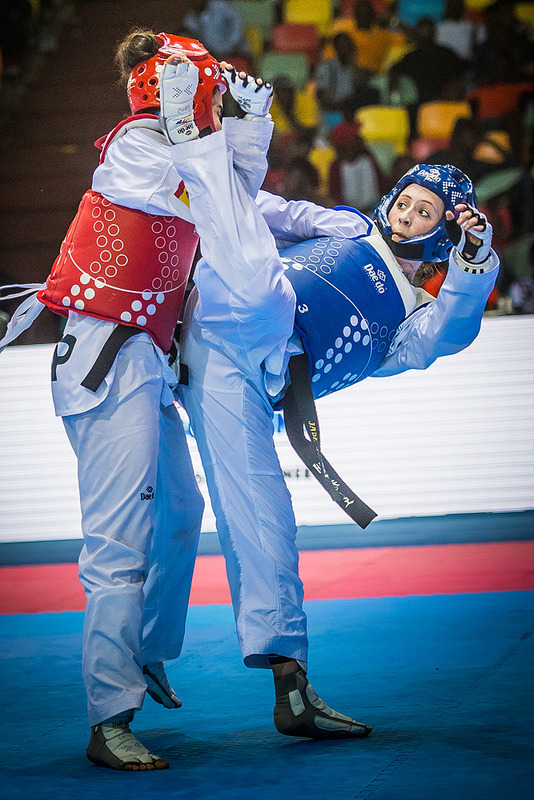 One is Yun-jo Jeong, 2017 Muju World Champion. (Note: There are twice as many weight categories in the world championships than in the Olympic weight categories are used in Wuxi.) The other is Jun Jang, who is a relative unknown in elite international competition, but who secured his spot in Wuxi after securing first place in the Grand Slam qualification. Audiences will be hoping that Jang can deliver a performance as exciting as that of another relatively unknown Korean player who entered via the qualification tourney: Hwan Namgoong delighted the crowd and took silver at the first edition of the Grand Slam. Despite the threats posed by these other fighters, Kim is definitely the top dog in the category. Another factor that will be on his side is the longer matches being pioneered in Wuxi: Instead of the usual three, two-minute rounds, the medal matches in the men’s division at the Grand Slam are five, two-minute rounds. The slender, whip-like Kim is a warrior for stamina, whose kicks just keep on coming, right down to the final buzzer. He is unlikely to gas out. So there you have it. While the other players must be desperately hoping to capture Kim’s crown, it is Kim who looks most likely to come out ahead.